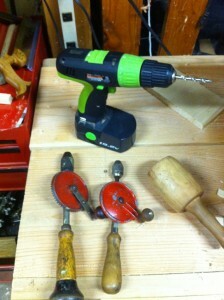 I’ve been slowly moving away from the use of Power Tools in my shop as I delve more into the Hand Tool world. One of the last ones I couldn’t and didn’t want to let go of was my trusty cordless drill. Lately though, the batteries have been running out sooner and sooner. To the point of being completely unreliable, which was making me sad. I have a bad wrist from a life of computer keyboard typing, and I can’t really do too much twisting and turning by hand. Enter the hand drill. I’d picked up a couple of these at an Antique Store about a year ago, and lost them in the clutter of my shop. Recently, as I put all my tools in my rolling tool box, I discovered them under a pile of tools. I did a little work on them, chiefly oiling the moving bits and gears, and tried it out. I was pleasantly surprised at how easy it was to drill small holes with this. It worked so much easier than I had imagined it would, and used it to drill the 1/4″ holes for my doweled joint on my Saw Box project. that takes a 1/4″ hex bit like a screwdriver. I understand it will give me a lot more control, and a lot more torque if I need it for driving screws. I’ve yet to use it, but I’m curious as to how it will perform. At this point the only powered tool I still use is the Lathe, and it’s going to be a cold day in someplace before I give that up. I’ve found that it’s so much easier to grab a hand tool and do the job quickly with out all the setup, noise, and dust of my other tools. This includes the table saw, which I find to be a very noisy scary device in general. I really enjoy the peace in the shop, and not having to wear a dust mask all the time. It makes my woodworking time so much more relaxing, and that is something I can really use these days with all the stress at my day job. I too chucked (ooops) the battery powered “cordless” drill a couple of years ago. Completely useless batteries cost nearly as a new drill, and more than the cost of my eggbeater. Have to get me one of those 1/4 driver bits. It’s the only thing I’m missing for the brace that’s a constant partner to the eggbeater. Your a brave man badger giving up your powered drill. I think there are probably several galoots who would never give up there powered drill, if nothing else but to do chores around the house. Good for you! It was a big step for me, it was the one tool I couldn’t give up. A combination of different methods, new tools, and a fading battery made this an easy decision.